Mary Beard, Ed Ruscha and Lorna Simpson awarded Getty Medals 2019. "A new show by artist Lorna Simpson summons fire, ice and history in reverse" by Julie Baumgardner on Lorna Simpson's solo exhibition, Unanswerable, at Hauser & Wirth London, UK, in Wallpaper magazine, February 28, 2018. "Acclaimed artist Lorna Simpson on courage, race and gender" by Julie Belcove on Lorna Simpson's solo exhibition, Unanswerable, at Hauser & Wirth London, UK, in Financial Times, February 23, 2018. "Evoking What Can't Be Seen" by Teju Cole on Lorna Simpson's solo exhibition, Unanswerable, at Hauser & Wirth London, UK, in New York Times Magazine, February 15, 2018. "Lorna Simpson, America’s Most Defiant Conceptual Artist, Makes A Radical Change—To Painting" by Dodie Kazanjian on Lorna Simpson's solo exhibition, Unanswerable, at Hauser & Wirth London, UK, in Vogue magazine, February 9, 2018. Lorna Simpson's new representation by Hauser & Wirth announced in ArtForum and ArtNews, April 4, 2017. “They are creative visionaries whose passions and work have shaped the cultural landscape.” - Lorna Simpson captures a series of portraits of American women in the Arts on Vogue.com, launched March 5, 2017. Lorna Simpson’s work was included in a virtual exhibition of the Venice Biennale selected by La Biennale di Venecia and Google Cultural Institute. The exhibition is a new online platform through which viewers can access a digital version of all pavilions and specials exhibitions of the Biennale. "After we summited the ridges high above Aspen in late July of this year, the artist Lorna Simpson and I finally had the occasion to speak at length" - A Photographic Memory: In the Studio with Lorna Simpson by Joseph Akel in The Paris Review, October 15, 2015. "With their hazy washes of graphite and ink, the paintings depict isolated figures in nebulous spaces—yet Simpson somehow ensures that these figures always appear to be concrete individuals, however inscrutable, and not abstractions. The paintings are somber, yet with an inner vitality that feels indomitable." - The 2015 Venice Biennale by Barry Schwabsky in The Nation, July 2, 2015. "The contrast between the real (the Ebony magazine photograph cutouts) and the imagined (Simpson’s sensational hairstyles) acknowledges hair not simply as a site of individuality, but as a site of control in culture at large." - Salon Style by Simone Krug in the Brooklyn Rail, June 3, 2015. Nero su Bianco at American Academy in Rome, Rome, Italy, May 26 - Jul. 19, 2015. "Lorna Simpson deconstructs racial stereotypes in her large-scale paintings displayed magnificently on the walls of Arsenale." - Okwui Enwezor's All the World's Futures: A Call to Action by Otona Damachi in Ours Magazine, May 13, 2015. Observations on "All the World's Futures" at the 2015 Venice Biennale by Andrew M. Goldstein in ArtSpace, May 10, 2015. All the World's Futures, Venice Biennale, Venice, Italy, May 9 - Nov 22, 2015. All The World’s Futures in Christie's, May 8, 2015. Postcard from Venice pt.1: 56th Venice Biennale, ‘All the World’s Futures’ by Amy Sherlock in Frieze Blog, May 7, 2015. America is Hard to See at Whitney Museum of American Art, New York, NY, May 1 - Sep. 27, 2015. Represent: 200 Years of African American Art at Philadelphia Museum of Art, PA, Jan. 10 - Apr. 5, 2015. Civil Rights: We have it in our power to start the world over again at Void Gallery, Derry, Ireland, Oct. 25 - Dec. 20, 2014. Body Doubles, at Museum of Contemporary Art Chicago, Oct. 25, 2014 - Apr. 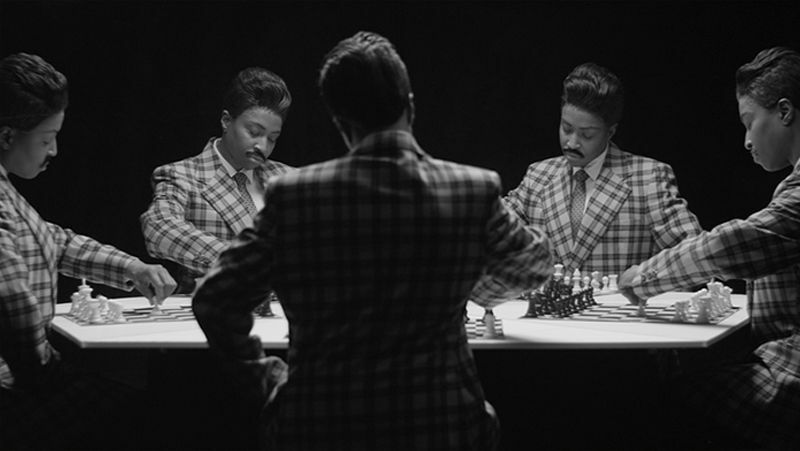 19, 2015 will include Chess as part of its North American premiere. Lorna Simpson, makes its American debut after traveling in Europe at the Addison Gallery of American Art on September 20, 2014 in Andover, Massachusetts. BALTIC exhibtition reflects on American artist's 30-year career by Barbara Hodgson, The Journal, March 2014. Culture Talk: Lorna Simpson on Capturing the Cast of ’12 Years a Slave’ for W Magazine by Victoria L. Valentine, Culture Type, February 2014. Regarding the Other: Lorna Simpson at the Haus der Kunst, ArtMag, 2014. Paris- Lorna Simpson at Jeu de Paume, ArtObserved, August 2013.